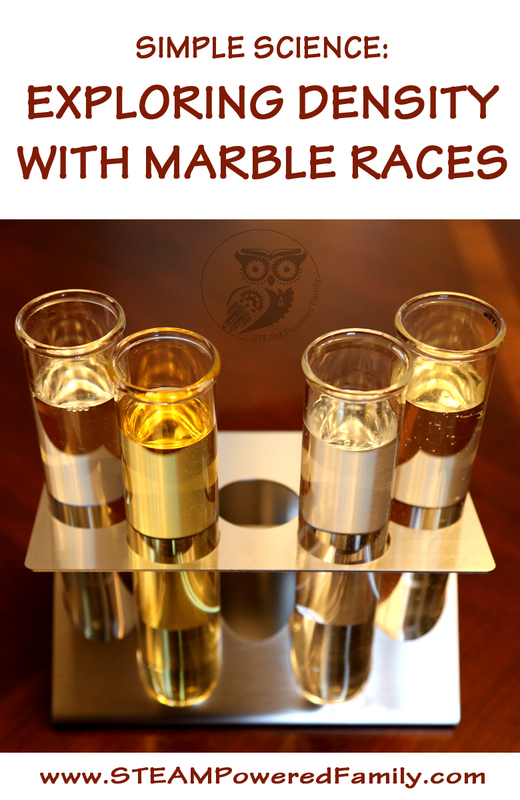 Density Marble Race is a simple science activity that is great for group and team experimentation, but can be adapted for a single person. Chemistry and physics have never been more fun for all ages! My oldest is really into chemistry and physics, so I’m constantly looking for ways we can explore the sciences at a level that will encourage his love of the sciences, rather than scare him off. Density is one of those things that we can play with in a simple, fun way and always leaves him begging for more. Density is the relationship between weight and volume and equates to how tightly matter is packed together in a substance. With liquid density, it can be equated to thickness of the liquid in it’s simplest form. The thicker the liquid, the more dense it is. 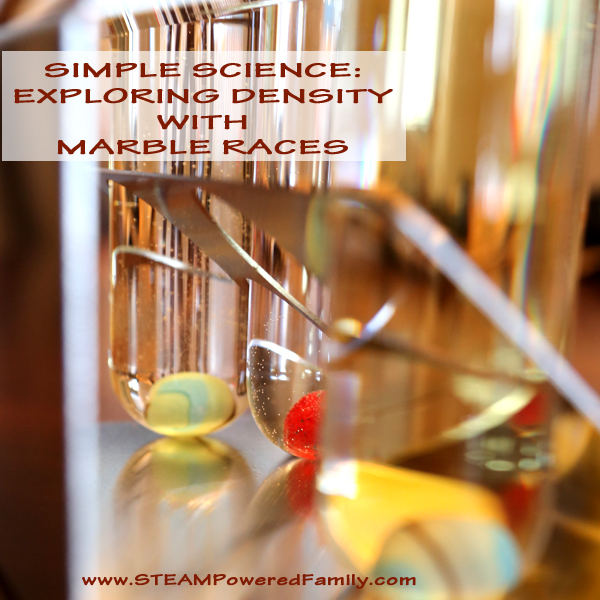 To explore this concept we decided to test the density of some household liquids using something kids love, density marble race! 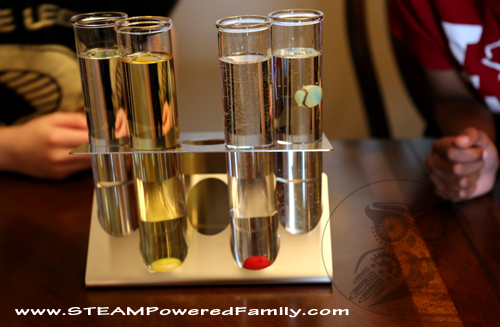 At least two different liquids – We tested water, vegetable oil, baby oil and corn syrup. In subsequent testings we added maple syrup, shampoo and some different cooking oils. To set up the experiment fill each container with a different liquid (ensure you label in some way so you don’t mix them up). Fill them to the same level. After discussing what we mean by liquid density, ask the kids to examine the liquids and decide which one they believe is the most dense. I love the insights the kids give when I ask these types of open ended questions. My oldest noted that the bubbles in our corn syrup were not moving, so that meant it must be the most dense. Plus if he wiggled the test tubes, the corn syrup moved the least amount. Some great insights! Explain that for this experiment we are going to do a marble race and drop marbles into each of the liquids. Now, ask them for their hypothesis for which marble will take the longest to sink the bottom. Ask the kids to each take a marble and hold it over the opening of one of the liquids. Once everyone is ready, do the big count down… ready… set… DROP! Have everyone drop their marbles at once. As long as you have picked some liquids with vastly different densities, it shouldn’t matter much if there are slight differences in how quickly the kids drop. In our case the water, vegetable oil and baby oil all hit the bottom quickly. Corn syrup took almost a full minute to reach the bottom. For older kids they may want to use stop watches and time the drops. Another thing you can do is to weigh each of the liquids to see the weight difference and compare that to the results of your density marble race. This helps to reinforce how weight relates to density. Nice experiment, my kids would like this one! I’m sorry for my english, but i have to say something. The experiment is really good, i’ll use it with my kids in early education, but there is a mistake in the concepts. I’m pretty sure that it isn’t density, it is “viscosity”(viscosidad en español). That concepts are ussualy confused, but we (educators) must use them right when we teach. Thank you for pointing this out. The scientist who taught me this said this specific effect was due to density, but viscosity definitely plays a role as well. I’m going to go do some more research as I did question this myself when doing this activity. There are many more, but I hope this clarifies any misunderstanding.